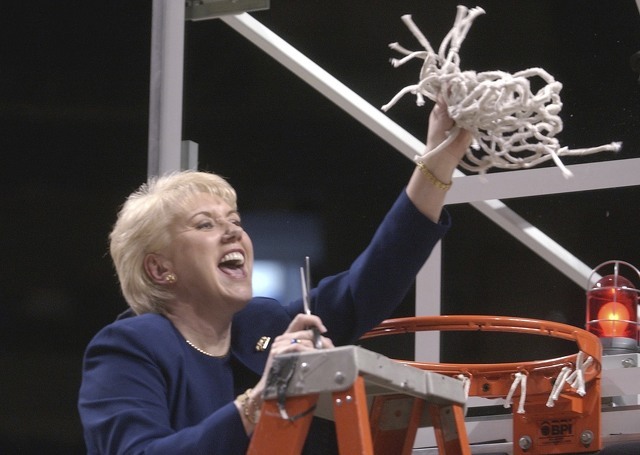 In this March 2, 2003, file photo Penn State women’s basketball coach Rene Portland waves the net she cut down to celebrate their Big 10 regular season championship after defeating Wisconsin in State College. Portland, who built Penn State into a women’s basketball powerhouse during a 27-year tenure, has died after a three-year fight with cancer. She was 65. I still remember the column. I was a relatively young sports writer, working at the Centre Daily Times, covering the Penn State women’s basketball team. I had just written a column which basically said that then-Lady Lion head coach Rene Portland should bench her daughter, Christine, who was struggling to get the ball in the basket. The Lady Lions were mired in a losing streak at the time. My editor and one of the best bosses I’ve ever had, Ron Bracken, gave me the thumbs up. The wrath, of course, was that of Rene. She would be none too happy with me and I knew that. On a beat with very few writers, she could make my life heck. I wrote the column, it ran and at her usual weekly news conference, I could feel her death stare from across the room. I expected Portland to hold a grudge. To her credit, she didn’t. I continued to cover the team and she continued to answer all of my questions honestly. At the conclusion of the season, I requested an end of season one-on-one interview, which is pretty common. Then, I thought, she would give it to me. Christine bounced back to have a decent season and I was ready to eat crow. Once again, Rene surprised me. She let me know that there would be an opening on the Penn State Sports Network for a color commentator. She encouraged me to apply for the role. I explained that I had only been a broadcaster of high school sports. Certainly, I wasn’t ready for prime time. I spent the next several seasons traveling with the Lady Lions and calling games alongside longtime play-by-play man, Jerry Fisher. During that time, Portland and I became close. I would talk to her on the team bus, on charter flights, at practices and after games. As strange as it was, we became friends. I loved watching practices and learning more about the game of women’s basketball than I ever imagined I could. I got to see Rene’s greatness firsthand. Although her teams weren’t very good — far from it — she got the most out of them. I was there for some pretty big wins — and some very difficult losses. She told me stories about coming to Penn State and being hired by then-athletic director Joe Paterno and how she had to fight, scratch and claw to make certain that women’s basketball got the same treatment that men’s basketball did. She convinced Paterno to move the Lady Lions out of the White Building. She wanted her own practice facility, and she got it. Make no mistake about it, Rene is the reason the Lady Lion brand exists. She wanted the program to stand on its own — and it has. As far as coaching is concerned, Rene is right up there with some of the all-time greats. The only thing missing from her résumé is a National Championship, though she did guide the Lady Lions to their first — and only — trip to the Final Four in 2000. When I heard that she had died over the weekend, I was stunned. The last I’d heard, she was in remission from cancer. I had no idea that it had come back with a vengeance. But that was Rene — she was a private person. After she was forced to resign from Penn State amid some controversy, she didn’t make many public appearances. I’m proud to say that she agreed to an interview with yours truly for a September 2014 piece in Town and Gown magazine. She talked openly with me, trusted me to write the story and sent me a handwritten note to tell me she was pleased with the way it turned out. My favorite Rene story isn’t about a big win, a tough loss or even a standout player. When I covered the team, I would often bring my very young son, Jake, along to the games. He would sit on press row and follow me into the postgame news conferences. Sure, it was a little unorthodox, but there were plenty of seats and Rene didn’t mind having him there. She would often joke with him, asking him if he “had any questions” or what he thought about the game. Of course, he became a fan of the Lady Lions and would often wear his No. 3 Brianne O’Rourke jersey to press row. Just before winter break, I asked Rene if it would be possible to get Jake a basketball signed by the Lady Lions. She told me she would “take care of it.” But she did more than that. After one of the postgame news conferences, she told Jake and me to wait in the press room. It cleared out and we were the only ones left in the room when Rene returned. She handed Jake a blue and white ball, signed of course, by every Lady Lion. His jaw dropped. She smiled and hugged him. “Merry Christmas, Jake,” she said. I could write column after column about all the good that Portland did for her family, Lady Lion basketball, Penn State and the community. She was one of a kind. And she will be missed. Rest easy, Rene. And thank you. Chris Morelli covered the Lady Lions for several seasons for several media outlets. He is now a radio broadcaster at AccuWeather.